Norwich City manager Chris Hughton is preparing for what he acknowledges is "a big month" for the Norfolk club. 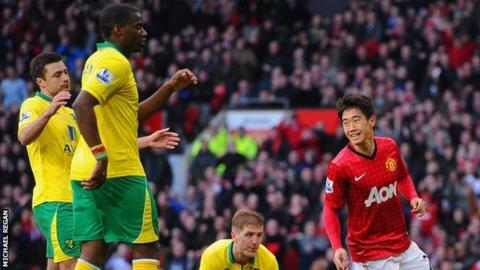 Saturday's 4-0 defeat at Manchester United left the Canaries on 32 points, having won just one of their last 11 Premier League matches. They are eight points clear of the drop zone, but Hughton accepts results need to improve quickly, starting against Southampton next Saturday. "It's a big month for us, as it is for a lot of teams," he said. Hughton told BBC Radio Norfolk the result at Old Trafford did not reflect the balance of the game. "We're the away team, up against the quality that they have, and for good periods we were very much in the game," he said. "The game here was never going to define our season, there aren't many teams who come here and create lots of chances. There's one team that has come here and won all season, and that's Tottenham, who are third in the division. "Anything we got was always going to be a bonus, and we made them work for what they got. "We have to respect where we are. Manchester United are flying at the top of the division, and I'd like to think them putting out the team they did, including the likes of Wayne Rooney and Robin Van Persie, was a mark of respect." The Norwich boss said the result emphasised the importance of having scored two late goals to beat Everton in their previous game. "If we'd lost that game, then coming here and not getting anything would have been a lot tougher. We now dust ourselves down and prepare for a very important game against Southampton," he added.